Three months ago, I put up a poll of ten series that the internet said were the best. My intention was just to find out what my readers felt about them. Then I started getting write in submissions by the truckload. So many that I ended up with some forty series to sift through. I had to run quarter finals and semifinals to get it all down to a reasonable sized poll for the best. But in the end, I have to admit that the finalists included series I had never even heard of. And one of them was the dark horse winner of this poll. Everyone give a big hand to Vorkosigan. It lost its lead to Lord of the Rings in the 11th hour but it got one more vote--the last vote cast--which broke the tie. Vorkosigan takes a victory lap. I'm obviously going to have to check that one out. And even though this series barely squeaked out victories in the quarterfinals and semifinals, it simply would not fade to Lord of the Rings. Lord of the Rings did strongly in every poll. I'm not sure how much of that is due to Tolkien and how much is due to Peter Jackson, but it is still well regarded as a great series. Harry Potter started low in the polls but got a bump every time I made a shout out on Stumbleupon for more votes. Obviously it well loved, even if not well regarded amongst some of my regular readers. You gotta give props where they're due though. There is only one author in all of existance that has seven titles on the top twenty bestselling books in English--and that includes religious texts. Chanur probably did as well as it did because of one reader's fanatic quest to stuff the ballot box. His efforts were unceasing and commendable, and I didn't care because I just wanted more votes. Still to be able to whip up that kind of enthusiasm requires something extraordinary. Dune was the little engine that could throughout all its polls. It consistently did well in every poll, and even though it never got above forth place, it never fell below fifth either. Dresden squeaked out a victory in the quarterfinals, and then blew away the competition in the semifinals. Here in the finals it has done okay, but not great. It seems to have a solid backing of fans but results that depend greatly on the series that it goes up against. The Song of Ice and Fire was one of the surprises of this poll. It did VERY well in the quarter and semi finals, but then just couldn't get past its own lackluster performance in the finals. It was only in the last few days of the poll that it pulled out of the bottom two. I suspect that SoIaF often got people's "third vote" when it wasn't up against entire polls of powerhouses. Foundation always did just well enough to squeak into the next round. I think this is one of those series that does better because it is recognized as a classic. Jhereg did well, in the earlier polls, but its performance slipped each time. The impression I got is that people like it, but that it just couldn't stand up to the other powerhouses. And of course Pern. Pern kinda just dribbled through all the polls, always just at the cutoff mark to move on. It did the same thing again. I think it is worth mentioning that just getting to this poll meant beating out thirty other series, so Pern might not be the Science Fiction/Fantasy connoisseur's first choice, it does seem to be a title that has been read and beloved by many. So go read some Vorkosigan. And thank you all so much for voting. For what it's worth, I recommend starting Vorkosigan with The Warriors Apprentice, as that is the first book to follow the main character, and better portrays the tone, IMO. Shards of Honor and Barrayarar seem more like prequels, though excellent ones. P.S. If you live int he East bay, both Berkeley and Contra Costa libraries have the entire series on audiobook via overdrive. Thanks Danielle. I'll give it a shot in the order you recommend. Danielle, I'm shocked! Reading books out of internal chronological order! That's not right! 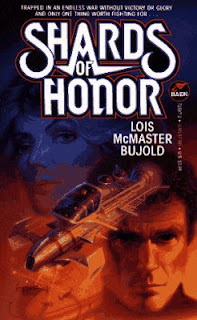 I highly recommend starting off with the first chronological book, "Shards of Honor". It's compiled into "Cordelia's Honor", which contains Shards and "Barrayar". These books are really important for establishing the universe, many of the recurring characters, and place a lot of little plot points that pay off big later. Start there, let naught stay your hand. Say hi to T for us, eh? I think it's worth doing chronological order just so you get Sergeant Bothari's history. It makes him much more compelling in "The Warrior's Apprentice" than he would be just as a normal minor character. The same goes for Cordelia, so you understand what sort of influence Miles had while growing up. I didn't vote in all this, just because I couldn't figure out how I would choose. Favorite children, and all that. Awww. You love them all equally. I feel a little deflated and sad I have no poll to keep watch on. Will you start a new one? (If it's not a big hassle) something like Most popular Poet or Best Horror Writer/ series? Yeah, I didn't get any help on what the new poll should be over on FB, but I'll think of something. It doesn't seem right not to have one going.